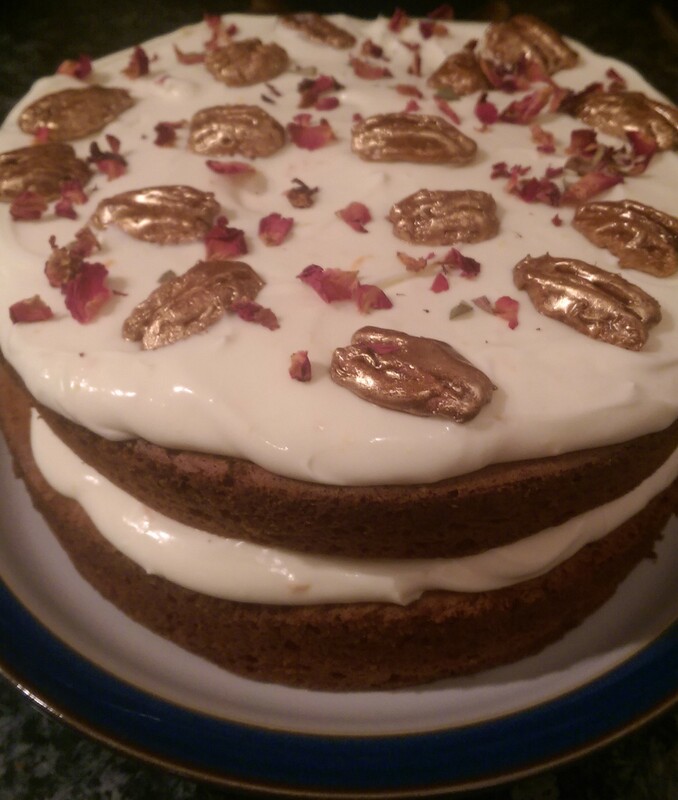 It feels right to get blogging again with a classic and as far as I’m concerned, the carrot cake completes the holy trinity of cake baking grande dames – flanked either side by the Victoria sponge and the chocolate cake. I know that a classic shouldn’t really need messing about with but I have to insist on pecans over walnuts here. You get all the texture without any of the bitterness and, when candied and dipped in bronze, you also get an ostentatious flourish that no diva worth her salt would turn down. Preheat the oven to 180ºC / Gas Mark 4 then grease and line the sandwich tins with butter and parchment paper. Using a stand mixer, cream together the oil and the sugar before slowing adding the beaten egg yolks one at a time on a slow speed, reserving the whites for later. In a separate bowl, sieve together the flour, bicarb, baking powder, salt and cinnamon. Add the grated carrots, lemon juice and the chopped pecans to the wet mixture before adding the dry ingredients on a slow speed. You now need to whisk the egg whites until you have stiff little peaks and then gently fold this through the mixture with a large metal spoon so as not to beat out all that lovely air. Divide the mixture between the two tins and bake for 40-45 mins. It’s best to leave the cakes to cool in the tins for about 10 mins before turning them out onto a wire rack. Once the cakes are completely cool, beat together the mascarpone, cream cheese and icing sugar until thick and smooth, then stir through the orange zest. This will be enough icing to go in the middle of the cakes and on top, so smooth over as much as you like using a palette knife. To candy the pecans bring the water and caster sugar to a rolling boil, making sure that the sugar is completely dissolved. Continue cooking the sugar until it begins to turn a light golden colour and then stir in the pecan halves. Carefully spoon each one out and drop it into a bowl of the bronze powder, then place them on a sheet of parchment paper to harden. Finally, sprinkle the bronzed pecans and rose petals over the cake. This entry was posted in Cakes and tagged baking, baking recipe, Cake, cake recipe, carrot cake, carrot cake recipe, Nigel Slater, Nigel Slater recipes, pecans by Natalie Glock. Bookmark the permalink. This cake looks super elegant and the candied pecans give it the perfect touch to its look.